Nancy Dane holds Bentley - her pal for over 20 years. 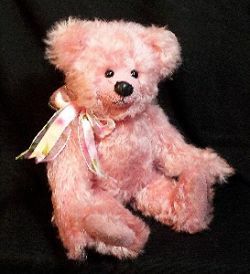 Growing up as a tomboy in Iowa, Nancy Dane of Bentley and Buddies does not remember having a bear as a child, but it eventually piqued her interest and she started collecting teddy bears in 1983. 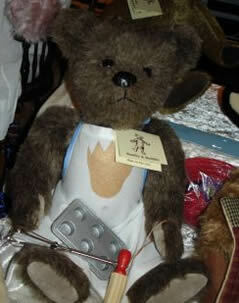 Since she had learned to sew and used those skills to make clothes for her family, she decided to give bear making a try. She made a bear for herself and a friend saw the bear and asked if she could pay Nancy to make one for her. 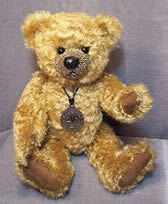 "One bear led to another and 20 years later, I'm still making teddy bears," Nancy remarks. The origins of their company name came simply enough. 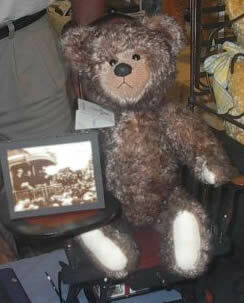 The first bear that Nancy made she named Bentley. 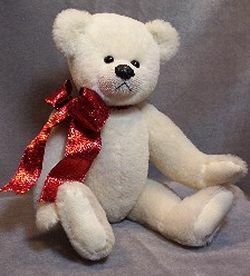 When she decided to start a bear-making business in 1986, a friend said that Bentley was the first and the others are his buddies; thus their name Bentley & Buddies. 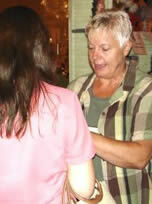 Before making bears a full-time business, Nancy worked in sales and owned a shop in Ames, Iowa. Now, she travels extensively with her husband, Doug to approximately 25 shows yearly ranging from California to Washington, D.C., Iowa to Florida. "Doug can pack a car with only enough room for us," said Nancy. "We like to do shows in the warmer climates during the cold winter months." 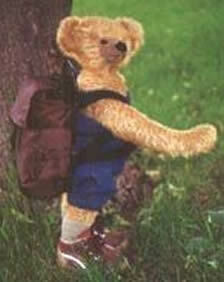 Accompanying them along the way is Bentley, Nancy's first bear. "He travels to all my shows with me. He collects pins, photos and memorabilia from where we travel. Now customers are bringing him pins from their travels," Nancy states, smiling. His backpack holds all his treasures. 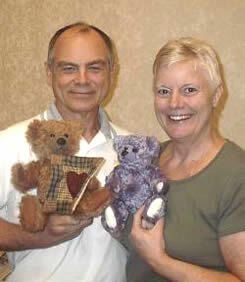 Inspired by Steve Schutt, who encouraged her to join the Iowa Teddy Bears Makers Guild, Nancy and her husband have turned Bentley and Buddies into a thriving business. Determined to have individual looking bears, Nancy is known for the hand-stitched leather nose she puts on all her teddy bears. "Our bears are made in the fashion to help you remember the teddy bears you had as a child; to bring a smile when you hold and hug them," Nancy feels. 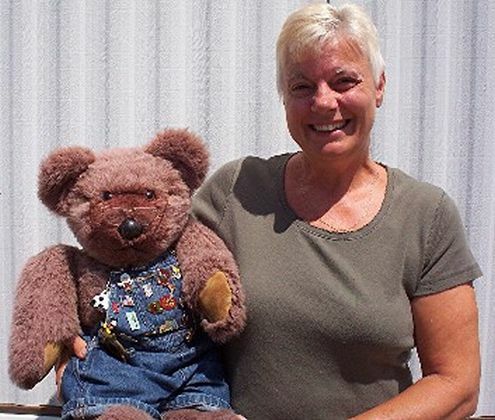 Whether selling at craft and arts shows, online, or at the various teddy bear shows, meeting and getting to know her customers is a highlight to Nancy's business. Nancy uses her website to let customers know what shows they will be attending so they can get a hands-on experience with one of Bentley's buddies. By signing the guest book on their website, customers receive show postcards, email announcements or discount admission coupons. Nancy is no stranger to recognition. 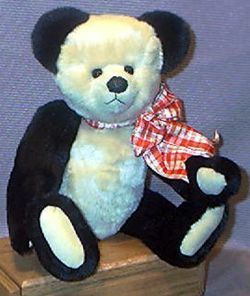 Bentley and Buddies were featured in the 1999 summer edition of Teddy Today, in the October 2006 Teddy Bear Review, won First Place at a Doll and Teddy Bear show in Florida, and Second Place at a Teddy Bear show in Tulsa, Oklahoma. In 1995, they were chosen to represent the state of Iowa on QVC's "50 in 50 Tour". More recently, one of her Panda bears was featured on the collectors' postcards announcing the Bright Star Promotion' show in Wichita Show. 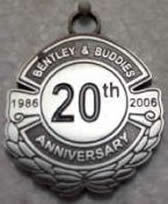 Bentley's has managed to make it through twenty years of experiences even though he has suffered a bit of wear and tear. "He has had hip and shoulder joint replacement surgery." Luckily, it has not slowed him down a bit. 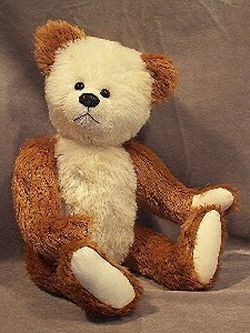 To help him celebrate his twentieth year, Bentley has a new friend; a special limited edition bear named Randolph who sports a commemorative medal. We hope that Bentley will continue to travel, taking Nancy, Doug and all his 'buddies' along with him, collecting good times and pins. So, here is to a New Year of fun, friends and fur. Happy New Year!